Today is the opening day for registration at An Affaire at Downton, Kim Caldwell's spring event May 1-4 at the Biltmore Hotel in LA. I'm very excited to be invited as one of the four teachers for this well-loved art event. And I love this sampler I designed for my class project and the theme of Downton Abbey. Based on one of Lady Violet's best quotes (words to live by! 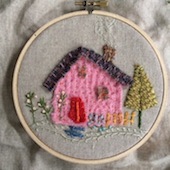 ), it's a simple stitch project that we will enjoy together for an afternoon in this elegant landmark setting. Visit Kim's blog for more details about this amazing event, the teachers, offerings and extras that Kim has planned! Hope to see you there!